Alex Georgiev is somewhat of a revelation. The undrafted free agent, plucked from SM-liiga after the 2016-2017 season, has quickly established himself as the backup goalie capable of starting in the NHL. Georgiev burst on to the scene last season with a .918 SV% in his 10 games. He struggled to start the season, and has quickly turned things around with a .909 SV% on a bad team with no defense. That SV% puts him at 28th in the league of goalies making at least 25 starts. Georgiev’s status is an interesting one with the Rangers. 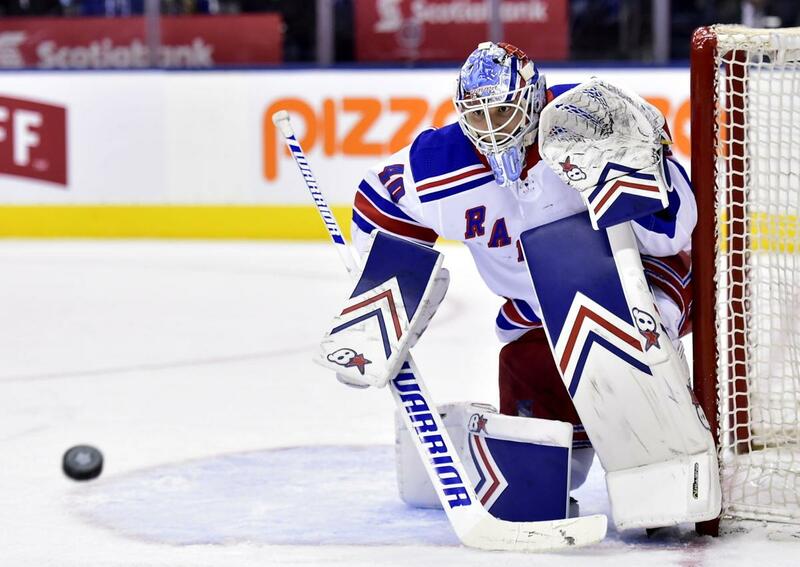 He’s not part of the immediate future, as that’s Henrik Lundqvist’s role. He’s not part of the up and coming kids, as that is Igor Shestyorkin’s supposed role. He’s a 23-year-old stopgap. When was the last time you heard of a goalie that young with his performance being a stopgap? The only thing that might change his status is if Lundqvist asks for a trade to a Cup contender. Or the Heir Apparent in Shestyorkin turns out to be a dud. Assuming neither of those happen, then Georgiev’s future in New York is cloudy at best. Talbot was 28 at the time, while Georgiev is 23. The Rangers were significantly better during Talbot’s years. When it comes to goalie trade markets, it’s almost impossible to predict. The goalie market, much like drafting goalies, is voodoo. Here’s a look at the last goalie trades at the draft over the past three years. The caveat here is that the goalie must be in the NHL and be the centerpiece of the deal. 2016 – Jonathan Bernier to Anaheim for a conditional pick. 2016 – Anders Nilsson to Buffalo for a 5th round pick. 2016 – Jack Campbell to LA for defenseman Nick Ebert. 2016 – Brian Elliott to Calgary for a 2nd round pick. 2016 – Reto Berra to Florida for forward Rocco Grimaldi. 2016 – Frederik Andersen to Toronto for 1st and 2nd round picks. Let’s call the Elliott and Andersen trades the only ones worth keeping in the same breath as Georgiev, in addition to the Talbot trade. That’s three starting goalies, each going for draft picks. Let’s compare those three to Georgiev. We can expand this to GSAA (goals-saved-above-average). We can get the actual GSAA numbers from NaturalStatTrick, which has Georgiev at a -6.80 and 78th in the league. For comparison’s sake, Lundqvist is 31st in the league at 2.47. So even with advanced stats accounting –at least partially– for poor team quality and high quantity/quality of shots faced, Georgiev just doesn’t have the numbers. Now this doesn’t mean that Georgiev can’t fetch something worth while at the draft. After all, goalies are voodoo. Brian Elliott was nowhere near as good following his trade from St. Louis, and it’s argued that his stint there actually inflated his numbers. Cam Talbot had two solid years in Edmonton, but then he fell off a cliff before being traded to Philly. The only goalie to hold his numbers is Andersen, who is tops in the league in GSAA right now. You never know what a team is willing to do for goaltending, especially young goaltending that comes with a cheap cap hit. Based off the evidence, though, it doesn’t look like the Rangers will get an offer worth their while for their 23 year old netminder. The stats aren’t there, and neither is the pedigree. In theory, holding on to him one more year might maximize his value. There’s no rush to trade him, after all. If some team comes calling with a solid deal, then great! Otherwise, is it really worth trading him for a mid-round pick? "Exploring a potential Alex Georgiev trade at the draft", 5 out of 5 based on 12 ratings. There are a few things that need to be worked out prior to considering a move of Georgi. Is Shestyorkin actually going to be here over the summer and next year? We need a definitive answer to this. Will Hank consider a move to a contender? Probably not, but we need to ask. I also think Shestyorkin’s presence helps Kraftsov a bit. While not a true factor, we want another Russian kid who can bond with Vitali. If all this is known, then you explore the market for Georgi. I tend to doubt you get a first rounder for him, but if that is offered up, you make the move. He also could be a sweetener in a deal to move into the top 3. Here again, I add him if it makes the deal. I am of the opinion that any good goalie can be a very good goalie after a year with Benoit. You have Buch, Namestnikov and Georgi (spent a lot of his life in Russia) plus Rykov (assuming he comes over as well), I think Kravtsov will have plenty of Russian “help” here with or without Shesty. As excited as I am that Shesty may come over, he still hasn’t played 1 game in the NHL. SKA has been a dominant team over the course of Shesty’s career there, the situation here will be completely different so a period of adjustment will be necessary — in terms of workload, the smaller rink, etc. That perhaps allows us to delay any decision re: goaltending for 1 year. Let Hank play 40+, Georgi 30+ and get Shesty’s feet wet with a few games. I don’t want to lose Georgiev for a bag of peanuts (like a late 2nd or 3rd round pick), but if like you suggest if it allows us to move up into the #2 or #3 slot it makes some sense — I want Kakko, bad. That said I have visions of a Bulgarian/Russian tandem down the line. We really don’t know who is the right goaltender going forward. The 1.11 GAA posted by Shestyorkin at SKA this year sounds unbelievable, but really not much more so than the 1.32 posted by Magnus Hellberg and we sort of know he is not even an NHL goalie. SKA is just a great team. A rough guess is that there is a 60% chance that Shesty is the right goalie going forward, 25% that it is Georgiev, and 15% that it is neither. Trading Georgiev is closing a path we should not want to close and there is no reason to do so. The Rangers have the opportunity to see who is better. Certainly you do not trade Georgiev for a second round pick. True, but Hank complicates the matter. If we’re talking rebuild for the possibility of 10 years dominance down the line then it means keeping both Georgi and Shesty around until one of the other goalies we’ve drafted proves to be an additional solution — or either one soils the bed. Hank sets a great example for both but he won’t be around long enough to push either one into elite status … but the two together can create a healthy competition. The question is, can you send either Shesty or Georgi down to the AHL for a prolonged period of time, can we dance with both spending 30+ games down there? I won’t proclaim to know Shesty’s mindset, but how long will he endure the AHL? Can Hank live with 35-40 games per season the rest of the way? Next year, Georgiev will be waivers exempt and the Rangers can shuttle three goalies if necessary. Shestyorkin can certainly spend a certain amount of time in the AHL. Next year should not be a problem and come May 2020, the Rangers should be a lot smarter when it comes to evaluating their goaltenders. It may be that everything becomes clear. Obviously Lundqvist is a complication. But I do not think the Rangers should worry about that now. It may be abundantly clear next spring who the goalie of the future and the Rangers can safely trade the runner-up. Or Hank might graciously retire. From a “what’s best for the team?” perspective, a Lundqvist buyout in 2020 seems likely to be wise, but the optics are awful and I doubt the Rangers are that committed to the rebuild. You could look at Mikko Koskinen though, 7 years older and yet Shesty outplayed him the prior two years. Guys like Hellberg and Koskinen are for the most part done “maturing”, Shesty is just starting. Except Shestyorkin also crushes it for the national team with monster sv%. Rangers D can make anybody look pedestrian, but I doubt they can drag him down to league average. sounds like the opposite of the rebuild methodology to me…. Henrik is not part of the future, he is part of getting us to the future…. Shesty is a rumor until he hits US soil. Seattle is coming… hopefully after the final season of GOT I pray! #40 is a good problem to have. … and the future is NOW … or if it not now, then at least by the last year of Hank’s contract. That’s when this becomes a real issue. Because I wasn’t sucking Lundqvist’s balls? BSB has become a board with good articles, and a peanut gallery of commenters. I refuse to interact with them any more, just log in, read the articles, and leave. 2 year deal so that he can be exposed in the expansion draft. Why expose him when we don’t have to??? Hank will be done and Shesty will be exempt. My mistake! I thought the expansion draft was next season. We will need to have a goalie to expose for the expansion draft though. Would Halverson be eligible? One goaltender who is under contract in 2017-18 or will be a restricted free agent at the expiration of his current contract immediately prior to 2017-18. If the club elects to make a restricted free agent goaltender available in order to meet this requirement, that goaltender must have received his qualifying offer prior to the submission of the club’s protected list. Trading Georgiev is utter nonsense. Shestyorkin hasn’t proven a thing, and Lundqvist is clearly in the twilight of his career. Georgiev is only 23 and so far, in his inexperience, has shown moments of brilliance. I really like this kid and his potential. I wouldn’t be to quick to get rid of him as he matures. Igor hasn’t proven a thing yet in the NHL, whether he can adjust to a better faster different style league, a different culture, a different rink, and the pressure of playing in NY. If Igor is going to take over NY by storm, in that case, I would rather see old faithful Lundqvist go then Georgiev. He may end up to be an elite goaltender in a year or two and if we trade him, with the Rangers luck and history of dumb moves, will probably end up a star on the Islanders! The idea that Georg and Shesty can handle the goaltending as a tandem over the next few seasons, and Hank should be shipped out or retire etc, is wildly off the rails imo. Georg has had 2 terrific months since the turn of the calendar. But his overall stats are skewed by the 2 phenomenal games vs Toronto – without those he would sit at .897 and significantly higher GAA. Those games were outliers for his season. In his 27 starts he has given up 5 or more goals SEVEN times. For contrast Hank has given up 5 or more 5 times in 49 games. Don’t get me wrong – I think Georg is going to be a very good NHL goalie but his sample size is extremely small. He has not shown, at the ripe old age of 23, that he can handle the rigors of playing 45-50 games at a consistent level. As for Shesty all signs point to him being a terrific goalie (that was true for Rick DiPietro too). He has not played on the smaller ice where things are much tighter and way more physical. The fact that Hellberg has almost identical stats, and that he is starting over Shesty in the playoffs, is enough to tell you that Shesty will need time to acclimate to the North American game. And so Hank, instead of being a “problem” is actually the solution. A proven (not to mention Hall of Fame goalie) who can handle up to 50 starts while the 2 youngsters figure out their games and have some important competition while not being thrown directly to the wolves. That is a win-win for the team and when Hank is done in 2021 you have 2 (hopefully) young NHL goalies ready for the big show. As I remember it G also had 2 really bad games, one was against Carolina for I think 7 goals. Two can play this game, without a couple of those games where the Ranger team didn’t show up he would have even better numbers. Those 2 young goalies need NHL game time, the AHL won’t teach them anything — well maybe Shesty for half a season. We can win and lose the same number of games give or take a few with or without Hank. It’s the same situation with every player: if a deal is there that improves the team, you make it, if not, you don’t. GM’s that are smart enough to recognize true talent and character simply stick to that policy, no matter what the crowd says. I thought you weren’t interacting anymore. Just reading and leaving! Can’t help yourself? I, for one, enjoy your commentary.